January 31, 2014. This plan highlighted awareness of the imperative to develop a sustainable "blue economy" initiative by realising the full potential of water-based activities in an environmentally sustainable manner. to growing the province's GDP, share of global and regional trade, competitiveness, long-term growth and employment. 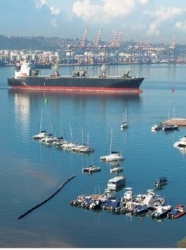 "To position KZN as a gateway to South Africa, Africa and the World, through efficient and sustainable utilisation of marine and maritime assets in order to stimulate economic growth and development." The Maritime Industry in KZN straddles numerous sectors (freight and logistics, ancillary maritime support services, tourism and leisure, marine energy, and fishing, aquaculture and mariculture). The boat building and repair industry presents opportunities for economic growth and job creation, given its labour intensity, strong backward linkages to industries such as steel manufacturing, as well as skills development. Aquaculture has been identified as one of the priority sectors for development by Government. A new emerging economic opportunity in the province is Marine Aquaculture (Mariculture); this untested field is another example of the diversity of untapped marine related resources in the province. reducing the cost of transport and logistics, thereby further stimulating the transport and logistics sector and encouraging development and employment creation within the key sectors of manufacturing, agriculture and tourism. The Province has a unique challenge to develop an integrated approach that adequately engages all these components as well as the varied public and private sector role players. This strategy seeks to create a conducive environment in which the broad KZN maritime industry can thrive. Produce a capable labour force through skills development, training and education. Growth and Development Strategy (PGDS), provides a number of interventions that either directly or indirectly impact on the KZN maritime sector. The interventions proposed seek to optimise existing infrastructure but more importantly, to build on KZN's competitive advantage creating economic infrastructure which will result in sustainable job creation. All stakeholders involved in the Provincial maritime arena must commit to ensuring close coordination and communication with one another, knowledge development and sharing, skills development and training, and enterprise development. Through commitment to this shared vision, KZN has the potential to truly become a trade gateway to Africa and the rest of the world.